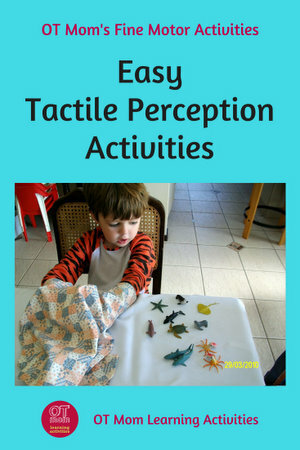 Tactile perception activities can help a child develop good touch perception. This, in turn, can aid in the development of good fine motor skills. The activities on this page are roughly graded from easy to more difficult, so start at the level you think will be the most satisfying and fun for your child and then make it easier or more challenging as needed. These activities will help your child learn to process touch feedback from the hands in order to use the hand and fingers more effectively. Most of the tactile perception activities need a bag to hide the objects in – simple instructions for the bag are given below, along with quick links to the different activities on this page. Most of the activities below make use of a “feely bag” – basically a bag that is large enough for your child to put both hands inside to feel the objects. Cloth bags are best, as plastic bags create too much distracting noise! You can even use an old handbag. I like to create two holes for the hands to go through – You can do this easily by using a safety pin to hold the bag in the middle – or simply sew it closed. Place various familiar household objects in the bag, and ask your child to feel one and tell you what it is without looking. Your child can then pull the object out and see if they were right! Tip: Make sure your child knows the names of all the objects. If language skills are an issue, then have a matching set of items outside the bag that your child can point to. Add interest: Use objects related to a theme, such as kitchen objects, bathroom objects, toys etc. Use packaged grocery items such as dried beans, rice, popcorn, macaroni, pasta shells, jelly sweets, raisins. First make sure your child knows the names of all the groceries, and have your child feel the packets to get a sense of how they differ. Pop the items inside your feely bag. Ask your child to put both hands into the bag, feel a packet and to tell you which item it is. After “guessing”, let your child pull it out to see if it's correct. Make it harder: Ask your child to find a specific grocery item. The more items are in the bag, the harder this activity will be. Let your child feel each shape as you describe it (or let your child describe it). For example: a circle is round and has no corners; a square has 4 corners and 4 sides all the same, but the diamond has 2 narrow/sharp corners and 2 wider corners etc. Put one set of the shapes in the bag, and place the other set on the table for your child to look at, to help with identification. Your child should use both hands to manipulate the shape and then tell you what shape it is. Make it harder: Ask your child to find a specific shape, or increase the number of shapes in the bag. Add interest by finding specific shapes needed to build a picture. Look at the animals with your child and talk about the difference in the animals: some have 4 legs all the same size, some have 2 big back legs, and 2 smaller “arms”. Feel the different arrangement of spikes, horns, ears etc. Put one set of the animals in the bag, and place the other set on the table for the child to look at. Your child should use both hands to feel the animals. Encourage your child to look at the set on the table to help with identification. Make it harder: Ask your child to find a specific animal, or use animals that are very similar, so your child has to pay attention to small details such as the length of the tails and snouts, the position of the ears, etc. The resources below are similar to the ones I use above, located on PFOT and Amazon for your convenience. These are affiliate links, which means I may earn a small commission if you purchase something through my links. However, you are under no obligation to purchase anything! 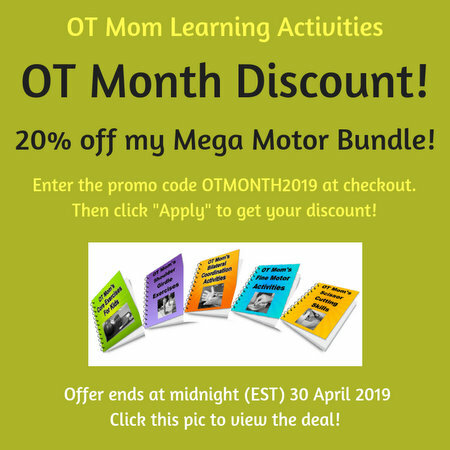 Use the promo code OTmom and get 15% off your order over $35 at PFOT! You can check out Tac-Tiles and other sensory products that I have picked out, over on this page. What is tactile perception (and why is it important)?